What have I done in the past two months? My two readers will be asking. After the Chiltern Wonderland 50 it was time to rest and prepare for the next 50 miler, the Wendover Woods 50, which I will run this Saturday. I was quite happy with my performance at the CW50. I did not do an incredibly fast race, but as my second 50 miler I think it was a good exercise in patience and careful pacing, which is not what I am usually good at. So I decided I did not need to do anything special to prepare for the WW50 except run consistently in the two months in between. Obviously I could not let 2 months go by without doing a race, so I decided to do two trail half marathons. After the CW50 I was pretty tired and due to a nasty cold I ended up running only twice the week after. One run was particularly fun as I found myself in Richmond Park so early in the morning it was still pitch black and I had to run blind. I was not ready for winter darkness yet! The following week I felt better and ran my usual six times including some nice tempo workout, a wet 21k on Saturday and a 17k on Sunday for a total of 74k. The week of the 3rd of October I killed myself: easy Tuesday, repeats on Wednesday, recovery Thursday, tempo run on Friday and finally 30k on Saturday and 20k on Sunday with very tired legs (103k in total). The real enemy of the week had been the stomach. Every single day I had cramps after 10k. Not good. Then came the week of the first half marathon. I took it easy running only 2 days and then on Saturday I ran the Wimbledon Common Half Marathon for the third time. I really enjoy that race. I love the woods in the Wimbledon Common and the organisation is always spot on. Nice little race. I ran it last year in the summer too (it is held twice a year) and finished 9th. I wanted to do better this time. It was raining and muddy so it was going to be tough to finish in a better time, but I was aiming for a top 10 finish nonetheless. I stuck with the lead pack as much as I could and settled for 5th place for the first 5k. I was then overtaken by two guys and tried to stick to them. The race is made of two laps with a climb at the start of each so halfway through you have to run up a muddy hill again. This is where I managed to get to 6th position again, unfortunately I lost it to another person a bit later. For most of the second half I was alone. The guys in front where too far to be seen and I could not see anyone behind me. In my mind I settled for 7th place and in a way stopped pushing. I could have probably done a better time if I had had someone to race with but I was happy crossing the line in 7th place in 1:29, almost 6 minutes slower than last year. It had been a lot of fun, but I was spent. Half marathons kill me more than longer races and I spent the rest of the day going from my bed to the sofa like a zombie with an upset stomach. With another half marathon to do a month later and 6 weeks to go before the next 50 miler it was time to ramp up the kms. 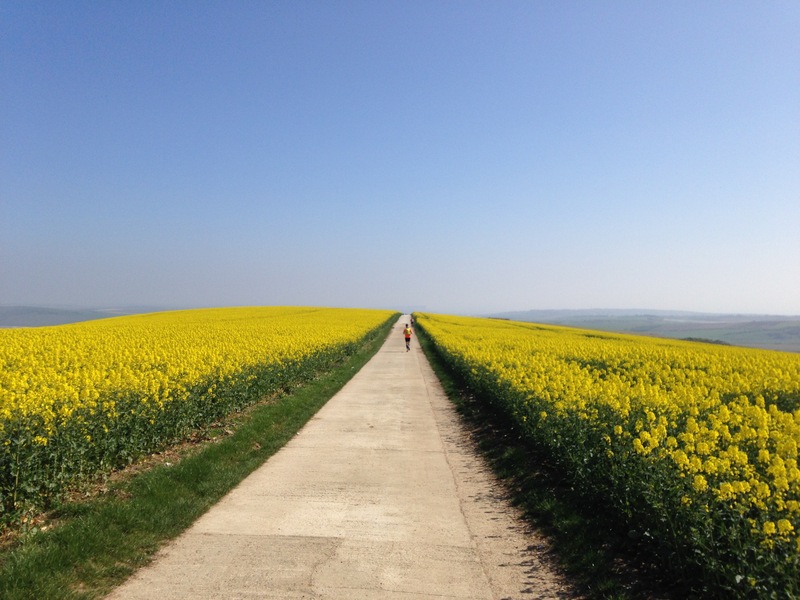 The next week I ran 88k, the highlight was a nice Autumn 20k run on North Downs Way early on Sunday morning. I really like those trails, but I had to cut it short as there were a lot of cows and I am scared of cows when I am alone, so I turned around a bit earlier than planned. Then it was time for another serious week. 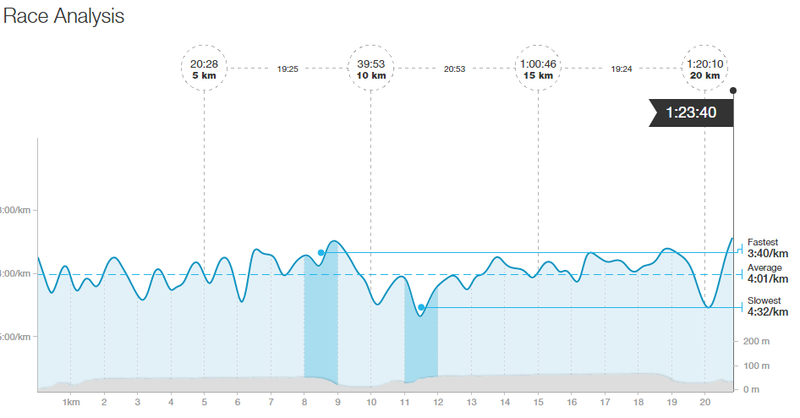 I ran 102km including a nice uphill repeat session, a tempo run and a 42k run to celebrate my 42nd birthday. It had been a nice solid week which I followed with another even better one of 120k with nice back to back long runs during the weekend (28 on Saturday and 39 on Sunday). That was it, enough long runs for the WW50. On the 12th of November I ran the Dirt Running Half Marathon. I really enjoyed it two years ago, it was actually my first race on trails. I had fun again this time, even if the weather was not very good. The first half of the race is along a canal so it’s really flat and you can run it fast. Then there is a hill that takes you to the woods. I killed me and I lost a couple of places. The second half is in beautiful woodland. I loved it, especially the breakneck downhills in slippery mud. The race ends with a couple more kms on the canal where I managed to get some speed back in and dropped the guy I had run the woods with. I finished roughly 5 minutes slower than the previous time. In part because the course was slightly different, in part because it was more muddy, but most of all because I am not as fast. Strava showed that I had been faster on the canal bit last time and there are no excuses there, no mud. I was pleasantly surprised I finished 15th overall and first in my category, SM40. It’s the first time I win anything and I was happy to step on the podium for once! Last week I took it very easy, trying to taper well. I ran 6 times but never pushed too much. I did a total of 85k while this week I will run very little before the race, just the 11k today. I will try to sleep as much as possible, stretch and foam roll every evening and just hope I can perform on Saturday as well as I did on my last 50 miler. I will surely do a post about the WW50 and then it will be time to talk about 2017! It was time to put my speed training to the test. After the NDW50 I stopped doing 100k+ weeks and concentrated on speed work. To check if it all worked out I was going to run the Richmond Park Half Marathon organised by RunThrough. They are the same cool guys that organised the Wimbledon Common Half I’ve ran last summer and really enjoyed. So I was sure it was going to be a small event like I prefer, but well organised. By the way, I will run the Wimbledon one again next month. Tuesday I ran 12km at 4:48/km on very tired legs. Thursday I felt a lot better after a day rest and ran 15km at 4:28/km and on Friday I did an easy 10km at 4:44/km. On Saturday I rested and ate a lot of pasta. So race day arrived. I was quite thrilled, I had not run an half marathon since last November and I was really looking forward to it especially as it was taking place basically in my backyard. I have run in Richmond Park so much that I was quite curious to see how it would feel to actually race in it. The day started very sunny and hot and I cycled to the race start. When I got there there were already quite a lot of runners basking in the sun lying in the grass waiting for the start. The race was made up of 4 laps. I do not usually like races with laps, but I found out it has its advantages. The sun was shining and the day was hot when we started. 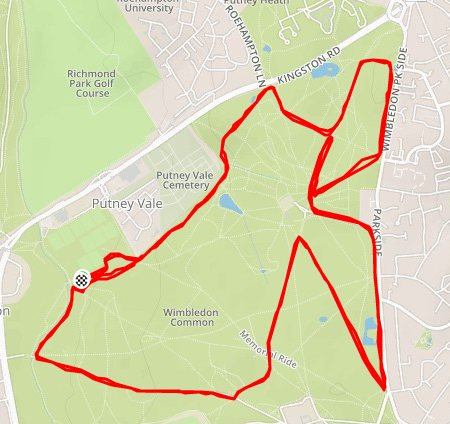 The first part of each lap was uphill, gently, but still uphill, on a large gravel path for a couple of km, then at the top of the hill near Richmond Gate it turned left on pavement going mostly downhill and then the final bit was on a grassy, very uneven path. The plan was to run around 4:00/4:10 m/km for the first 3 laps and then accelerate in the last one. As usual the plan was forgotten straight away. The first lap I kept a pace just below 4:00 except for the final grassy/sandy last km that I found super hard on the legs. In the second lap I really found it hard going uphill again. It was also very hot. Every lap I would take a small bottle of water and by the end of the lap I would have drunk half of it and splashed the other half on my head. I have become too used to British weather, when I’ll run in Italy this summer I will melt. The cool thing about it being a laps race was that I could adapt my pace to what was coming and my strategy became: do what you can uphill and then bomb it downhill. So I alternated slower kms at 4:21 going up with well below 4:00 m/km in the downhill bits. I really enjoyed it as it became a real race between me and a couple of other people. I ran a lot of km with a guy and we were pushing each other quite a bit. I had to run faster than 3:40 for a couple of km to be sure he would not catch up with me. I am sure he could feel we were fighting too, and I enjoy that, especially as I finished faster then him. After the first lap I also learnt where it was better to run on the grassy final bit (avoid the central sandy part!) and it became much easier. After the second lap we started lapping a lot of people so I could not really guess in which position I was. I started the race hoping I would finish in the top 15 so I was pretty happy when I crossed the finish line and heard the speaker say I was 10th. Even happier when the official results showed I was 9th! It is always good to finish in the top 10, I love it. I was not expecting to do a PB as it was not a flat race so I was not too surprised by not even finishing with an average below 4:00 m/km, but I am very happy with the final result and the “racing” feeling I felt. You know when the legs go faster than you expect and they feel like they know what they are doing, you feel good. I could have pushed a bit more uphill in the second and third lap. Easy to say now! Overall a very good fun race, very well organised and as always Richmond Park was amazing. If you are interested you can see my Strava of the race here. I cycled back home and had a massive barbecue with friends. Unfortunately all the sun that made me sweat the first 2 laps was gone and it was actually raining. Not ideal for cooking sausages, but I really enjoyed the company and the cold beer.